Is coming to church worth your time and effort? We think so. Worship is for those who know their need for God. From all over the Quad Cities, people come carrying broken hearts or nagging questions. They bring hope for belonging to a community and to a mission bigger than their own lives. It could just be that St. Paul needs you as much as you need the church. There’s a service just right for your weekend rhythms. Sundays at 7:45 a.m.: An “early bird” service with traditional sung liturgy, preaching, and special musical ensembles. 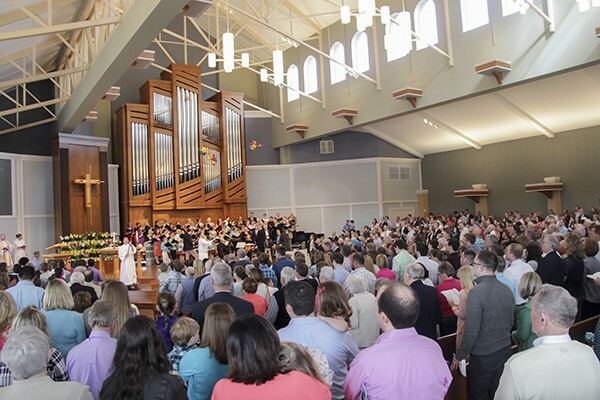 Sundays at 9 a.m.: A traditional or blended liturgy with choirs, preaching, and a children’s message. Sundays at 11:15 a.m.: Our Open Spirit contemporary service, with a more informal style for music leadership and preaching. A children’s message is included. All of St. Paul’s weekend services include Holy Communion. God’s gifts of bread and wine assure us of Christ’s forgiveness and presence in our lives. The Lord’s Table is open to believers of all Christian traditions. Come and eat. • Emergency bags stuffed with soft toys, books, and crayons are available. • Staffed childcare is available on Sundays as needed. • Audio speakers broadcast the service in the Gathering Area and the Nursing Moms’ Room, if your child needs a break from worship. • Children’s choirs add special joy to worship. At St. Paul, we aspire to more than individual spirituality. We value “the center.” We ground our lives in the glories of communal worship, each and every week. Together, we listen for God. We sing songs of praise. We discover hope. We give thanks. We welcome all.